MGS MOC Release No. MOC2-505, 6 October 2003 Northwest Hellas Planitia presents an array of strange-looking surfaces. This Mars Global Surveyor (MGS) Mars Orbiter Camera (MOC) picture shows an example near 39.3S, 306.7W. The scene is illuminated by sunlight from the upper left. Some of the banding apparent in this image may be related to layering, but the overall cause for the patterns remains elusive. 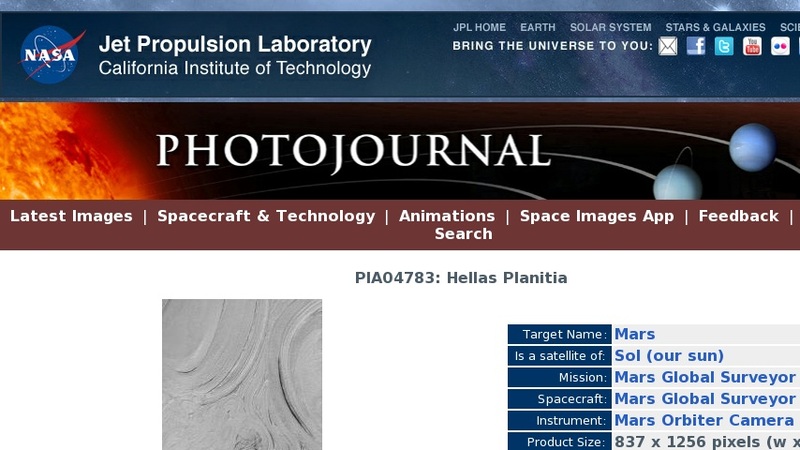 Hellas Basin is a difficult place to obtain MOC high resolution images, because for most of the year it is cloudy. The clouds clear up and imaging opportunities are spectacular in southern autumn, the time of year that this image was obtained. This picture covers an area 3 km (1.9 mi) wide.